Healthy Breakfast Pizza -Avocado. Fried eggs. Pizza dough. 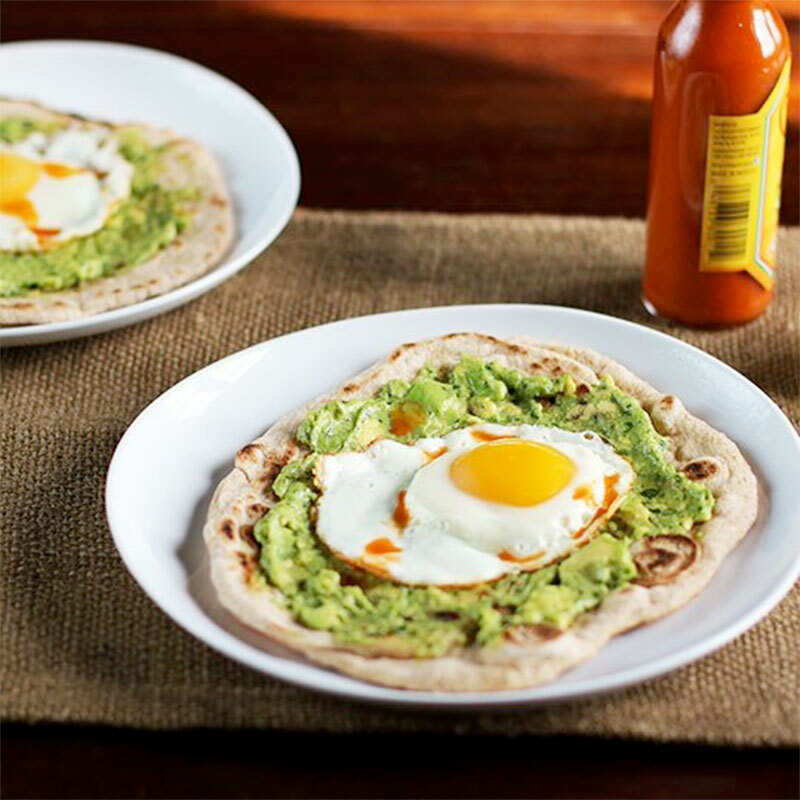 I probably don’t have to tell you that combining three of the world’s greatest foods gives you one fine breakfast: a warm round of chewy crust topped with a bright, cilantro-speckled avocado mash, and the perfect oozy egg. I’ve always eaten breakfast, but for many years I subsisted on cereal with milk, or toast with butter and jam — simple, carb-y meals that usually left me hungry a couple hours later. My habits have changed and now my breakfasts always include a helping of protein and fat along with my carbs, which help to keep me satisfied until lunchtime. Avocados and eggs often make an appearance, but not usually on the same plate. That’s what makes this Healthy Breakfast Pizza recipe special. In this preparation, the pizza dough is cooked like flatbread or pita, laid on a hot skillet until it bubbles and browns on one side, then flipped to brown the other side before being topped. Pizza snobs will say this is not a true pizza. That’s fine — pass your avocado and egg not-pizzas over to me. I’ll eat them. Of course, that means you could take a shortcut and use store-bought pita or flatbread for a busy weekday breakfast. But resist the temptation to use a store-bought guacamole in place of the avocado mixture. It takes just minutes to mash together and is so good you’ll be tempted to throw away the pizza idea entirely and just eat it out of the bowl with a spoon. Which isn’t necessarily the worst idea, but then you’ll miss out on the egg. And you don’t want to miss out on the egg. Cut the avocado in half lengthwise, remove the pit and, with a large spoon, scoop the flesh into a medium bowl. Add the cilantro, lime juice and salt. Mash with a fork until smooth, with a few chunks of avocado. Taste and adjust seasoning. (Depending on the size of your avocado, you may need more salt or lime juice.) Set aside. Heat a well-seasoned cast iron skillet (see Recipe Note) over medium-high heat until very hot. Place one of the dough circles in the center of the skillet. Cook for 1 to 2 minutes, until the underside is browned and the top surface is bubbly. Flip and cook other side until browned, pressing down with a spatula if the dough puffs up off the bottom of the pan. It may be charred in spots, which is fine. Transfer to a plate and repeat with remaining dough circles. Spread 1/4 of the avocado mixture onto each cooked piece of dough. Heat the oil in a skillet over medium heat. (If using the same skillet you used for the dough, first let it cool slightly and clean out any burned flour that may be sticking to it.) Fry eggs to desired doneness and place each one on top of a pizza. Serve immediately, with or without a drizzle of hot sauce. If you don’t have a cast iron skillet, you can use a stainless steel skillet. Film the pan with a very light layer of oil before cooking the pizzas. A half pound of pizza dough is about half of a standard pizza dough recipe, or half a batch of store-bought dough. For this recipe, I used half whole-wheat flour, half all-purpose flour in my dough. The pizza rounds can be cooked up to 1 day ahead and stored in an airtight container. (It will be softer than when freshly made.) Warm in the oven or on a skillet before adding the toppings. Store-bought flatbread or pita can be used instead of pizza dough for a quick breakfast. Warm bread before adding the toppings.